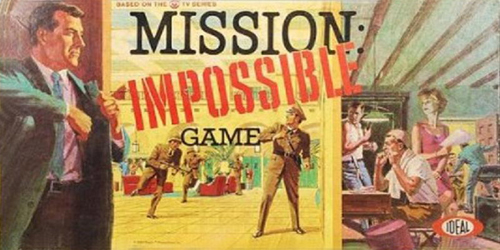 The Impossible Mission Force is a secret agency of American Intelligence. The basis behind the organization was that there were many assignments deemed so impossible which still needed to be attempted but since their likelihood of success was so small, the 'official' intelligence departments of the government were loathe to attempt them. If a band of unofficial agents, not connected to any branch of the government, were to try and fail, deniability would be available. Exactly to whom the members of this elite squad answered was never stated. The terms of each mission laid out in the taped briefings, clearly indicated that the 'Secretary' would disavow any caught or killed agent. This would leave out the CIA or NSA or FBI since they were run by Directors. Both the State Department and the Department of Defense are viable possibilities, especially since most of the missions were against enemies of a foreign nature. However, many of the later operations were against domestic enemies, particularly the 'Syndicate'. The procedure behind each mission was basically the same. The team leader would be directed somehow to a never-repeated location where the assignment would be given. A taped message which would self-destruct shortly after play concluded was accompanied by whatever documentation was needed, usually a small group of photographs. It was up to the team leader to devise a plan to accomplish the goal. Who his team members would be was up to him, chosen from a group of volunteers who were all highly skilled in one field or another. The leader would choose the team members, brief them on their assignments, and then go into action. While the team leader had a decent number of candidates from which to choose, and would on occasion use a new one, it became obvious that he had a trusted set that he went to over and over. Each of these people must have been very successful in their own right or highly compensated by the IMF team because they were pulled away for a dangerous mission at a moment's notice many times each year. The first twenty-plus documented missions were lead by Dan Briggs, a fairly plain looking, non-descript man who nevertheless possessed an incredible mind for planning incredible schemes and for being able to shift to equally ingenius plan-b's when things went wrong. Briggs was generally calm under any circumstance but on occasion he was not adverse to letting his feelings show, if only momentarily. As the series progressed, Briggs stopped leading the team and was no longer part of the action. It was never stated what the reason was and there was no indication that he had been disavowed in any way. He simply stopped running the team. 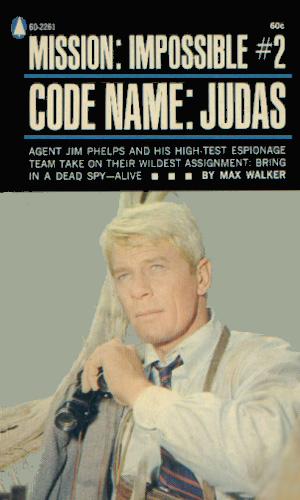 He was replaced by a silver-haired man of equally impressive planning capability, the handsome and sophisticated Jim Phelps. Phelps' good looks and charm allowed him to mold himself effortlessly into any role. He could be a movie producer scouting a new location or an investment banker on the trail of a good buy. He could charm the ladies and back-slap the men with equal aplomb all the while keeping an eye on everything happening around him and listening via earplug to his teammates. Every good undercover team needs a gorgeous, seductive femme fatale to lure men to their doom, smooth-talk secrets from the shyest stranger, and on more than one occasion slip a mickey into a glass. For almost half of the documented adventures, that part was filled by the former model, Cinnamon Carter. She had a sultry look that could memorize the coldest dictator and a set of lips that begged to be kissed but which would only allow it if she got her way. As alluring as she definitely was, she showed on many occasions that she was as strong willed as any of her male colleagues and, when captured a time or two, she held up under very unpleasant circumstances. Upon her departure from the team, she was replaced with the raven-haired beauty known only as Tracey who worked a score of missions. After her there was golden-locked Lisa Casey and the ultra-sophisticated Mimi Davis. A good disguise is invaluable in an undercover case. The IMF team went far beyond the normal use of fake mustaches and wigs, however. Using the skills of true geniuses in the arts, they were able to create facial masks which were virtually undetectable unless extremely close-up. Added to that the skill to learn to mimic a person's voice and physical patterns and the team had someone who could not only sneak into the enemy camp, they could replace a key member with a look-alike to destroy from within. The quick-change artist known as the 'Man of a Million Faces', Rollin Hand, was the inside disguise man for many of the earlier missions. When he left the team, he was replaced the 'The Great Paris', a magician whose real name was never disclosed. Technology, always advancing at a fantastic pace, was constantly an intrical part of any of the plans. It was vital to easedrop or display a holographic image or turn the lights or heat on or off on cue from a distance. Smoke and mirrors were never enough; magnets and acoustics and light shows and much, much more were required. Handling all of that while squeezing through incredibly tight ventilation shafts and crawl spaces and drilling inside walls and so on was Barney Collier. Collier was not only a certifiable genius for the devices he understood and created, he was also an expert at forgery and could create documents good enough to fool virtually anyone. Finally, all the equipment that was used often weighed a ton and that meant someone strong had to be there to cart it into place and, when a suspect or a corpse needed hefting, it was the strongman's job to do it. Willy Armitage was that muscle for virtually every mission that Briggs and Phelps led. Generally a man of few, if any words, Armitage was a great man to have at your back with brawn was needed, whether it was lifting a great weight or punching a nose. It also fell to Armitage to help procure the many things needed for the job, not an easy task to do in foreign countries with little notice or support. The IMF team fought dictators, would-be world dominators, mad scientists, assassins, hitmen, gangland leaders, and the occasional dirty politician or law enforcement official. They did so without fanfare or recognition. They had to because they did not exist and could and would be disavowed in an instant. For many years, Jim Phelps was the leader of the IMF team which put down an incredible number of tyrants, mad scientists, underworld crime bosses, corrupt politicians and the odd assortment of crackpots and despots. Each time he received another mission, deemed impossible by the powers that be and strife with the likelihood of failure and disavowment for the actions, he came up with a plan and the right team to pull it off. As all plans go, they often needed adjustment when in the belly of the enemy and he was able to concoct a coherent viable Plan B. As all things must end, so did the time for the incredible group of operatives and their leader and retirement ended their escapades. Phelps handed to a successor the satchel filled with volunteers from which he chose the members for each mission. Who that new man was was never divulged as the saga of the IMF team found its finish. Almost a decade and a half would pass. The representative from the Secretary showed up on Phelps' doorstep with word that his replacement had, after many years of service, perished on a mission. There was no one ready or able to take his place. The IMF project would be put in mothballs unless Phelps came back and took control, at least as long as it took to train a new guy. Reluctantly the now aged silver-haired spymaster took command again, his first mission being to track down the one who killed the former leader. In the new IMF team the jobs to be performed remained much as they did in the first group. Nicholas Black was the master of disguise, able to create molded face masks so lifelike as to be almost undetectable. Adding in an incredible gift for mimicry and voice impersonation, he was able to be just about anyone he needed to be. The electronics and gadgetry that the IMF needed to use had increased tremendously over the years and keeping up with all that high-tech wizardry was Grant Collier, son of the original gadget-guy, Barney Collier. The younger man was not only great with doo-dads and behind the scene schenanigans but he also was quite a good actor so his role was heightened. The strong man needed to cart huge containers of whatever was needed was filled by Max Harte who added to his skill set with the fact that he was a very good pilot, useful for getting into and out of danger. Lastly, the femme fatale, so vital in virtually every mission to charm, distract, bedazzle, and bewilder, was handled by two different women. First was Casey Randall who handled her job remarkably until tragedy struck and she was killed, becoming the first member of a Phelps team to be disavowed. Her position was taken up by the equally capable and beautiful and intelligent Shannon Reed. The recorded number of the missions of this new team was considerably fewer than Phelps' first go-around but the world had changed quite a bit since he released the reins and Phelps found that he and his people had to think faster than before and be prepared to have everything change at a moment's notice. They were ready for it. The amazing success of the television series, deemed almost immediately a hit, showed what a terrific idea the developers had and they knew they needed to maximize their rewards. In addition to a game or two and the usual lunch pail and other marketing merchandises, they knew that books had to be in the line-up. 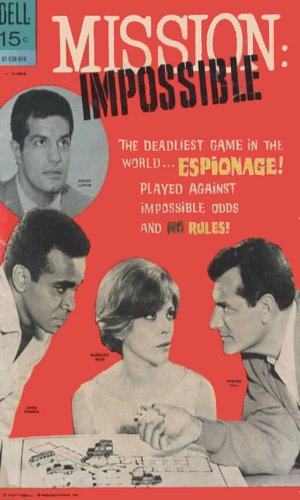 They needed an author who could do justice to the intellectual property and they turned to Walter Wager, a man who had under his pen-name of John Tiger already created several good selling spy novels in the I Spy franchise. He did not disappoint his readers. In fact, since creator Bruce Geller had been so reticent to reveal the back story for any of the characters, Wager took it upon himself to create some tidbits about Briggs and later Phelps himself. Another author, Max Walker, also had a hand in the television tie-in novels, drafting two of the four. As with most movie and television tie-ins, they were never expected to set the world on fire. They were just to please the more intense fan and generate more revenue. They definitely succeeded. Dexon-9 is a nerve gas which attacks the brain cells, leaving the inhaling victim an imbecile, incapable of reasoning. The despot in charge of the northeast South American nation of Santilla wants to use the dangerous creation to further his power. Naturally, it is the IMF who must stop him. Dan Briggs leads. The Soviet agent codenamed Atlas, endowed with a fantastic memory, had prowled the inner regions of Red China and learned the facts behind a plan to invade the West. Now this agent, after a falling out with his bosses, has faked his own death in Switzerland. The IMF must get to him and extract the secret plans from his mind. A genius American scientist is the creator of a fantastically miniature computer capable of putting the U.S. technology years ahead of the Opposition. Naturally, the other side wants him desperately. When he has insists on attending a World Inventors' Conference on a Caribbean resort island, the IMF sent to keep him alive. The target is Little Ivan, a cute name for a very dangerous tank, said to be indestructible. The IMF must steal this tank so the West can acquire the new metal that makes up the armor, even though the tank is behind the Iron Curtain. 5 Please Can We Have Our B.A.11 Back? Found in TV Action Annual 1974. Phelps and his team have the mission to rescue Prof. Von Heinken from a maximum security prison in Central Europe. Can they all get out alive? A collection of 3 short stories, 3 reprinted Dell comic book missions and 5 features as follows. A genius scientist in a small Middle Eastern country has created a man-made protein that can help feed millions if perfected but the man has been thrown into prison protesting the dictatorship that controls his homeland. The IMF must get him out. The small Caribbean nation of Esperanza has a fledgling democratic government which the Communists are trying to disrupt by flooding their economy with counterfeit. The IMF must stop the plot. 2. Please Can We Have Our B.A.11 Back? Taken from Episodes 2-11 and 2-12. Released outside the US to movie theaters in the UK and other countries. Honest Businesses have been taken over by a criminal mastermind and it is up to the IMF team to stop him. 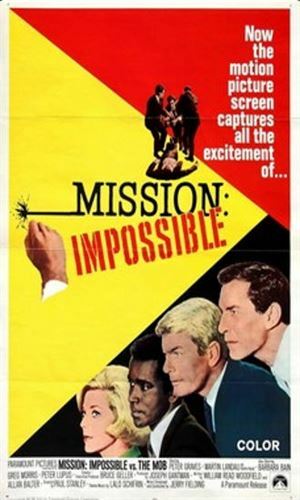 From September, 1966 to March, 1973, on CBS, the IMF handled 171 hair-raising missions against a wide assortment of enemies, both foreign and domestic. The show, created by Bruce Geller, proved to be extremely popular prompting considerable satires on comedy shows. The premise is simple. There are many missions which are flat out impossible to accomplish - certain to fail. Since someone has to try anyway, that dirty task falls to the members of this elite group of volunteers. Each mission, the leader, be it Dan Briggs or his replacement Jim Phelps, would come up with a plan and select from his collection of volunteers those needed to carry this plan out. These volunteers came from a wide range of professions, each person good at their normal job be it modeling, engineering, acting, sports, or whatever. They had offered their talents to be called upon when the need arose. It was up to the leader to choose which volunteer was needed. The plans usually involved disguises, seduction, misdirection, gadgetry, and subterfuge. They were awesome stories! Often far-fetched, relying on the bad guys being far more gullible than would be assumed and the good guys have a ton more luck than anyone deserved, especially week after week. And yet it worked reliably for seven years and left the world with a super-catchy theme song, a image of a fuse burning that was unmistakable and a phrase that became part of the American lexicon, "this tape will self-destruct in ..". In the first season, the leader was Dan Briggs, played by Steven Hill. When shooting schedules put work on Saturdays, Mr. Hill elected on religious reasons to not return the next year and the handsome Peter Graves was pulled in for the role. He would remain in charge for the remaining six seasons and for second series as well. 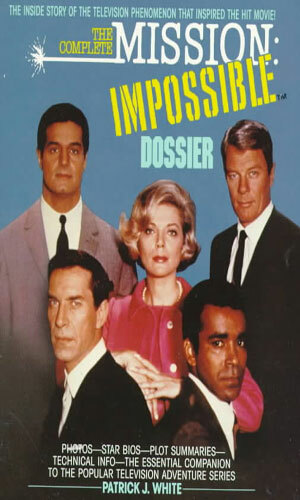 Other steady agents were Cinnamon Carter (Barbara Bain) and Rollin Hand (Martin Landau) for the first three seasons until contract negotiations well apart and they left. The role of primary female ingénue was somewhat in flux from then on with Lee Meriwether as Tracey in season 4, Lesley Ann Warren as Dana in season 5, and Lynda Day George as Lisa Casey in seasons 6-7. On all the jobs, fancy gadgetry, electrical wiring, bugging, and any other technical tricks were carried out by the highly resourceful and ever dependable Barney Collier, played admirably by Greg Morris. And the man who carried all of the heavy equipment and, on more than one occasion an unconscious body or two, was Willy Armitage, played by Peter Lupus. One tidbit floating about had the reason that there was virtually no character development and, except for a couple of episodes of a personal nature, little background on any of the characters was that Bruce Geller wished the emphasis to be on the mission, not the agents. Mr. Geller passed away at a very young age while engaging in his off-work passion, flying, so the idea remains unsettled. A memory expert is part of the IMF team to fool an Iron Curtain authority to arrest a major player. When the expert is captured, the rest of the team must rescue him. Imry Rogosh is a killer paid by a foreign power to cause turmoil in the US. The IMF team must grab him and convince him that his employers are now in charge and angry with him, forcing him to reveal what his instructions were. Part 1. The IMF team must find a way to free from a Iron Curtain prison an aging resistance leader. Part 2 - The Cardinal has been moved to a different location but Rollin Hand, who allowed himself to be imprisoned, is trapped unless the rest of the team can free both men. The monies earned with his casino is allowing Prince Kostas to buy the armament needed to attack a neighboring country. The IMF must break the bank. The Dell Publishing Company had a branch which produced comic books from the late 20s up to the early 70s. During its heyday it sold as well as its more famous competitors (DC and Marvel) but with the passage of time, most of its output has been forgotten. It never achieved the blockbuster stage with characters like Superman and Batman on the DC side and Spiderman and Fantastic Four at Marvel. What it did have was a very large stable of titles that sold consistently and with its distribution prowess, those comics were in every drug store and five-and-dime. One of the specialties of the Dell Comics was the use of licensed material. If a television show looked at all promising, it would likely generate a comic-book tie-in. 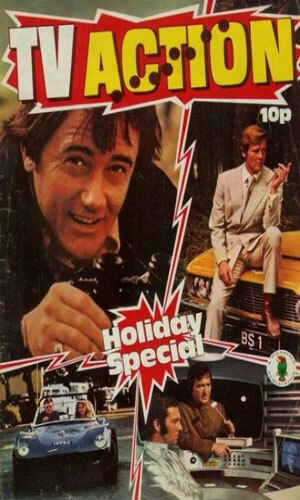 These were often short stories in graphic format, 12-18 pages each, sometimes two stories to an issue. 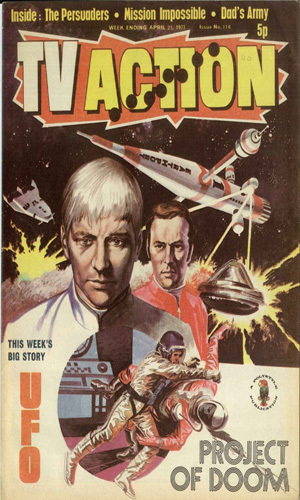 Each issue was a standalone, readers were not expected to have read the one before. Unlike DC/Marvel who had monthly series, Dell was content with often quarterly periodicals. Since they did not need to produce a new issue of a title every month, they could produce many titles. This fed back into the standalone philosophy because while the other comic book companies, especially Marvel, might expect to hold a reader's excitement for a month, if the next installment of an ongoing story was not coming for three months, attention spans wavered. Since these subjects were licensed, the writers and artists were severely limited in what they could do with the stories. No significant character development was allowed as it could contradict something that came later in the property's main line. With the standalone concept, each story had to be wrapped up inside the covers of one issue which did not give much room for complex plots. 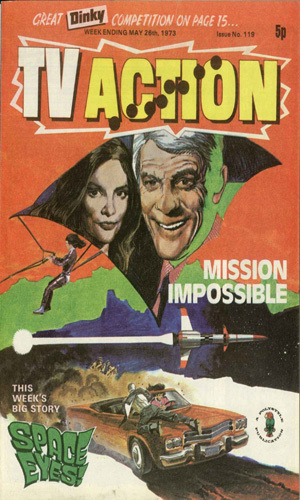 This is seen clearly in the four issues of the Mission: Impossible comics. 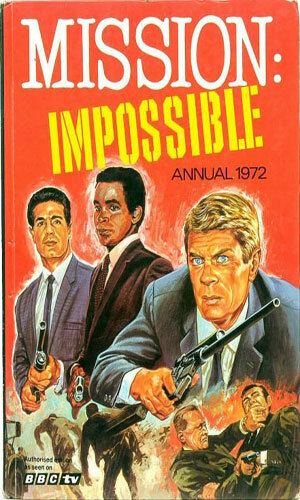 While five issues of the Mission: Impossible comic book were released, it was really only four. One year after the 4th issue, for whatever reason (possibly contractual) a fifth issue came out but instead of being new material, it was a complete re-issue of the first one, cover and all. 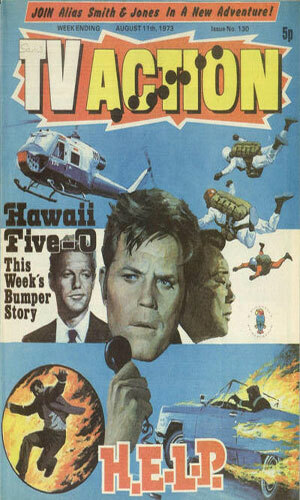 A few years later as the show was being aired in the United Kingdom, a magazine put out by Polystyle Publications, TV Action, filled its pages weekly with stories and articles about both British and American action shows. The content each week varied often. 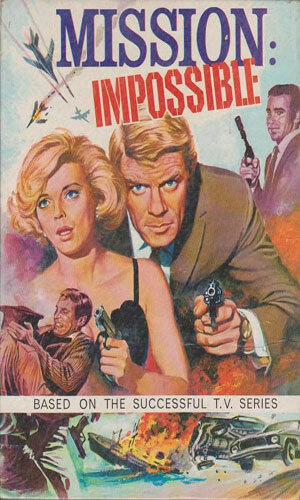 Mission: Impossible saw several issues containing original tales in comic book format. Some of these adventures were 7 or so pages long in a single issue or others were spread over several issues with 2 pages in each. 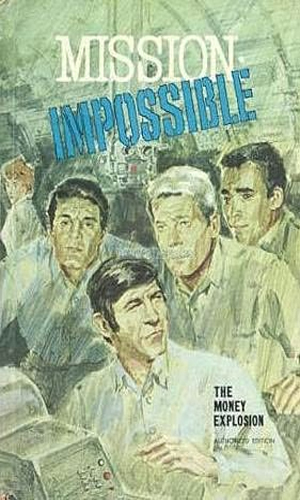 1st story in Mission Impossible #1 - (18 pages) - A reconnaissance plane crashes into the sea just a few miles off a Communist Caribbean country. The IMF team must get the camera and destroy the rest of the plane. 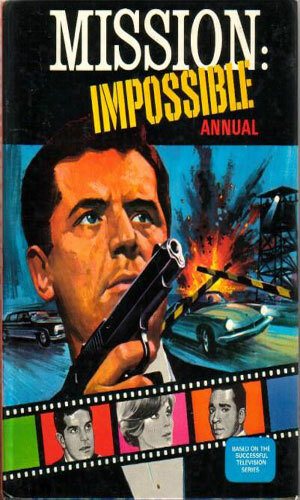 Story was reprinted in Mission Impossible #5 and in Mission: Impossible Annual 1970. 2nd story in Mission Impossible #1 - (14 pages) - China's leading nuclear physicist wants to defect. He is attending a symposium in Europe and the IMF team heads there to get him but it feels like a trap. 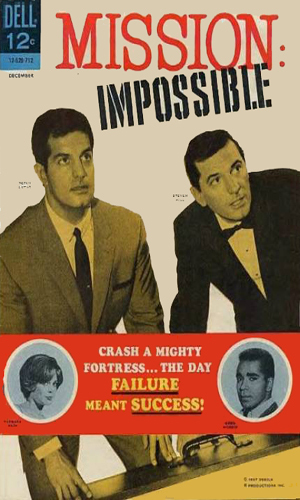 This story was reprinted in Mission: Impossible Annual 1969 and in Mission Impossible #5. 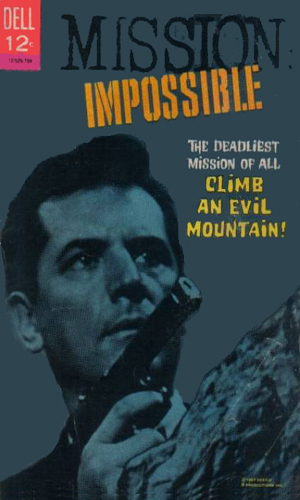 1st story in Mission Impossible #2 - (16 pages) - A Soviet agent inside the Third Reich had buried a list of other agents high up on a mountain top behind what is now the Iron Curtain. With others after it, the IMF team must get to it first. 2nd story in Mission Impossible #2 - (16 pages) - A Caribbean dictator is sponsoring a bacteriological laboratory and is close to creating a dangerous weapon. The IMF team must sneak a scientist inside the lab to render the weapon useless. 1st story in Mission Impossible #3 - (16 pages) - An ultra-secure NATO missile bunker in Europe is the target for the IMF to see if they can break in. If they can, the enemy eventually might. 2nd story in Mission Impossible #3 - (16 pages) - An American diplomat and his assistant has been arrested behind the Iron Curtain and charged with spying. As they await a big trial, the assistant has been brainwashed to testify against his boss. The IMF team must break into prison and reverse the process. 1st story in Mission Impossible #4 - (16 pages) - The wife of a major East German industrialist wants to defect and bring with her major documents. She is being watched constantly by a jealous husband making her leaving impossible. 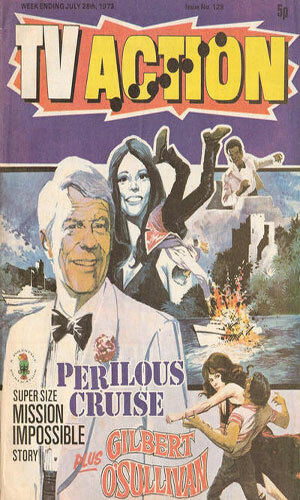 Story was reprinted in Mission: Impossible Annual 1970. 2nd story in Mission Impossible #4 - (16 pages) - A VIP diplomat for the West has shown up on an island ruled by a dictator. He is a prisoner but is going to be shown to be a defector to that land unless the IMF can free him. Their plan is to hijack a plane to get to the island. Found in TV Action No. 111 with 7 black & white pages divided into 2 parts (4 & 3 pages). The M.I. Force must rescue a Professor Minsk who tried to defect before he is shot into space. Found in TV Action No. 114 thru No. 118 with 2 black & white pages in each or 10 pages total. $50 million in gold has been stolen from a train by the Mafia and it is up to the IMF team to get the gold back. Found in TV Action No. 119 with 7 black & white pages divided into 2 parts (4 & 3 pages). A Russia woman becomes head of the U.S. Space-Eyes Network, but then is hurt and kidnapped. The IMF Team must rescue her before she tells what she knows about a top secret satellite system. Yet is she still working for the Russians? Found in TV Action No. 122 thru No. 126 with 2 pages of story in each or 10 pages total. A judge sentences a man to death for his crimes in 1963. For 10 years the man waits and then is given freedom because the death sentence is abolished. Now the IMF team must protect the judge and his family. But the oldest daughter gets kidnapped and the man freed is the one who has her. He wants a ransom, so the team goes into action to save her. Found in TV Action No. 128 with 7 black & white pages, but printed in 2 parts (on pages 2-5 & 21-23). A Super Size Mission Impossible Story. The IMF Team's mission is to protect thirteen wealthy people on a cruise in the far east. Found in TV Action No. 130 thru No. 132 with 2 color page in each or 6 pages total. A mission to kill a Colonel Sayid Khan fails, so the IMF team is sent to stop a possible war in the Middle East. Found in TV Action Holiday Special 1973. New machine guns are hi-jacked and the M.I. team is sent to get them back. Will the visiting Oil Sheikh buy the guns or will he enjoy cowboy movies? Read and find out! 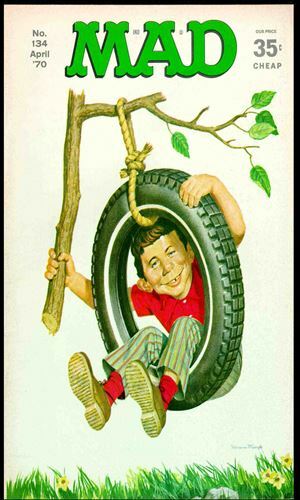 Printed in Mad Magazine #118 and from the "To Scheme the Impossible Scheme Dept." 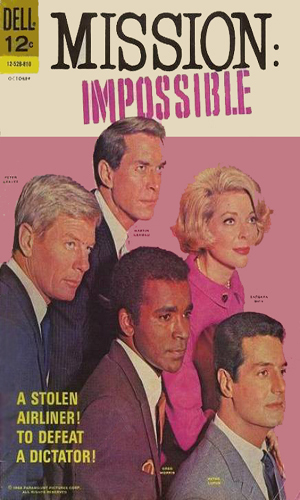 A parody satire of the TV Series with Peter Graves as Mr. Phelts, Greg Morris as Blarney, Peter Lupus as Billy, Martin Landau as Bowling and Barbara Bain as Synonym. This team of secret agents try to retrieve stolen microfilm in the most questionable way they can. 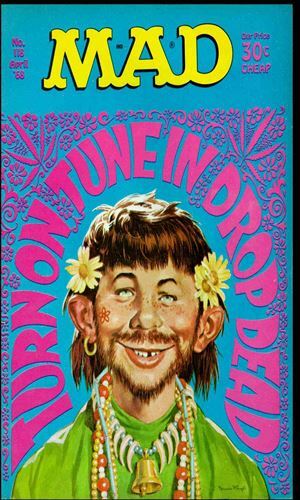 Note: This comic story was reprinted in Mad Super Number Five in 1971, in Mad Super Special Spring 1981, and in 1001 MAD Pages You Must Read Before You Die in 2009. Printed in Mad Magazine #134. A short one-page satire of the TV series. 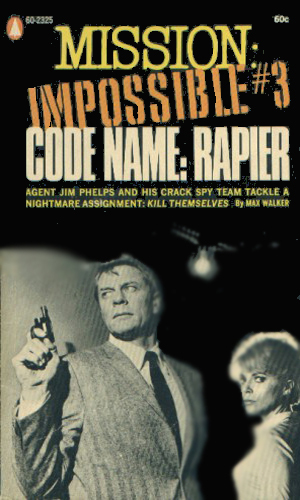 Mr. Phelps (Peter Graves) gets an assignment that is quite unexpected. Note: This comic story was reprinted in Mad Super Special Spring 1981. in Mad About TV in 1999, and in Totally MAD in 2012. A game for 2 to 4 players. The players start at the four corners of the board using the spinner to move 1 to 6 spaces. 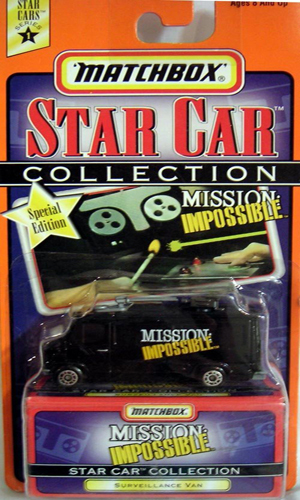 There are also Road Block and Mission Impossible Card that are used. Winner is the player that finishes his or her mission by getting to the center of the board. Appears to have been a game like Parcheesi or Sorry. A 1/25 wild customized kit of the famed Open Roadster Convertible Car from the highly entertaining TV series. All parts were authentic reproduced so the car would be spot-on like the real car. Your mission is to build a version in tan, gold or blue. 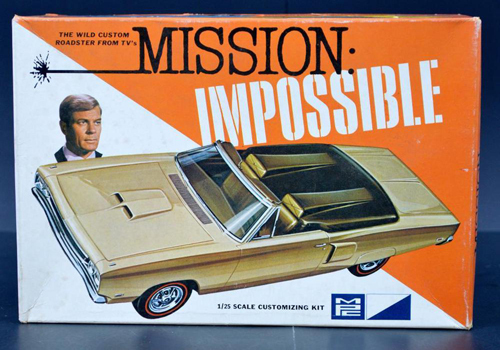 All vehicles were made of die-cast metal and as Special Edition with storage box to remember classic moments past. Recounts the history and origins of the famed popular television series. Discusses all contributions of the cast, the crew, the writers, the directors and producers. Also gives star bios, plot summaries for each of the episodes and some behind the scenes information as well. 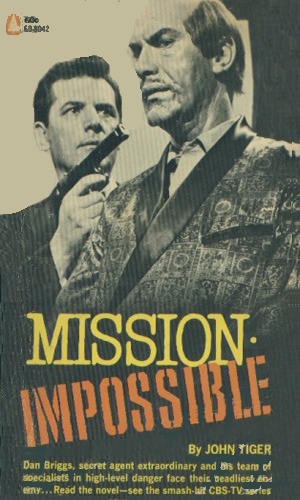 A terrific reference guide for all who might have a need for more Mission: Impossible. Reprinted in 1996 in the UK. 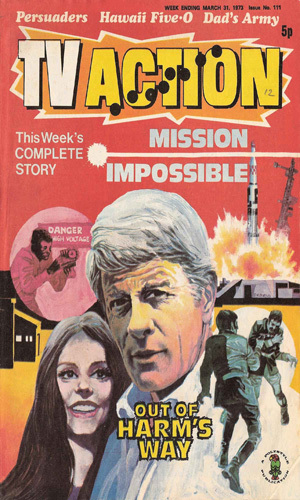 I doubt you could find anyone who has read any spy series who has not seen, or didn't know quite well, the Impossible Mission Force. 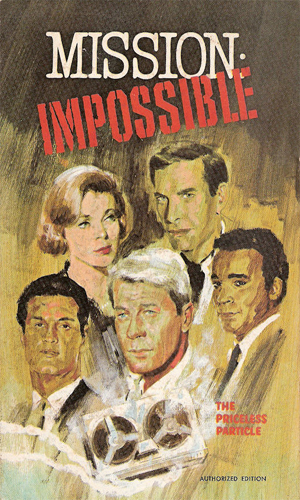 It lasted longer on television than any other spy series and provided several icons to American culture: theme music, self-destructing tape, disavowal, and doing the impossible. It was terrific. I loved it! 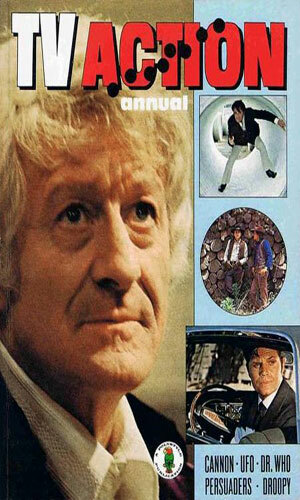 As a teenager I followed the adventures week after week and though even I at time marvelled at how dumb the bad guys could be at times, it never was onerous enough to keep me from enjoying the show and coming back next week. Though you never got to know the background on any of the characters to speak of, you got their basic essences right away. Briggs and Phelps would come up with some Plan B at a moment's notice if needed. Collier could fix any device with chewing gum and spit (this was before the wonders of duct tape became as known as they are now). Woe to any bad guy, no matter what size they were, who tried to get past Armitage when he was set as a blocker. Do not look deeply into Cinnamon's eyes (or Tracey or Casey) lest you lose your will power. And do not trust anyone because no matter how well or how long you know them, they could turn out to be Rollin Hand or the Great Paris in disguise. 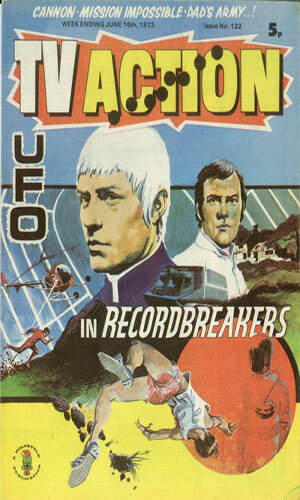 The series was made first and foremost for television and it worked best there. The books are enjoyable add-ons to the television show. By themselves, they would not have made it but since they were never intended to stand on their own, they work reasonably fine. The same could be said for the comic books. Neither medium allowed for anything other than the standard but since the tv show limited itself to that, no harm done. I was a huge, gigantic, unabashed fan of the original series. Many of the last few years' missions were missed by me while serving in the military but my memory of the show and my appreciation for it never sagged. For that reason, I was ecstatic when I learned that the IMF team was again working behind the scenes to keep us safe. 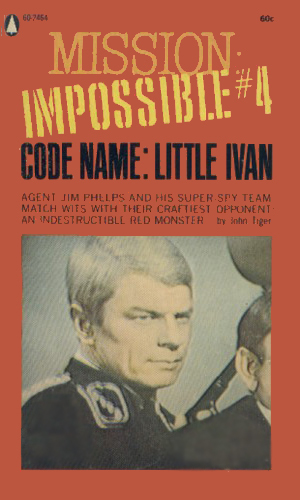 And the fact that it was being led again by Jim Phelps, played so fantastically by Peter Graves, made me even more excited. The show tried its best and did entertain me but it did not do well enough to survive more than two years. It was considered by many to be a failure. I disagree. First, the climate in the television industry had changed to an only-the-top-survives attitude. In the race to be the best, shows that were only good were thrown out in the hopes that maybe, just maybe the next one coming along would be the One. For the show to have made it not only through a first season but also a second was impressive. Add to that the fact that the schedulers of the series moved it from Sunday night where the older generation who knew the original would see it to Saturday when nobody watched much. They did this half way through the first season so many fans lost track of where (or more accurately, when) it was. Then in the beginning of the second season, it was moved to Thursday but put it up against the blockbuster The Cosby Show, almost a death blow. When ratings dived even further, they moved it back to Saturday nights. Bouncing time slots can kill any show. But even a rabid fan such as myself had to admit that the revival did not have the same spark that the original did. It was good. Just not good enough.